A friend invited me to her potluck 40th birthday. After racking my brain for a few days over what to bring, I decided on chocolate brownies. What better way to celebrate with a bunch of women than a tray of sinful dark chocolate brownies with a generous sprinkle of cranberries and walnut. After several rave reviews from the ladies, I decided to post a photo and recipe. You'll probably do a far better job cutting up the brownies compared to me. I have a dreadful habit of impatiently chopping and cutting things in a rather haphazard manner. The recipe is again from one of my favorite cookbooks, "In the Mood for Food" by Jo Pratt. I've replaced dried cherries with cranberries which was the only dried fruit I have in my cupboard. As for the chocolate, I used organic dark chocolate with 85% cocoa (from Green & Black), instead of 70% but either one works fine. Give it a try. The recipe is straightforward and easy to make. As for the chocolate brownies, every bite is indeed sinful and divine. Preheat the oven to 180 C/ fan 160 C/ gas 4. Grease and line an approximately 20 x 30cm rectangular baking tin, 3-4cm deep with greaseproof or parchment paper. Melt the butter and chocolate either in a bowl over a pan of simmering water or gently in the microwave. With an electric hand whisk, beat together the eggs, sugar and vanilla extract until they are lovely, thick and creamy. Mix in the melted chocolate and butter. Finally, stir in the flour, salt, cherries (cranberries) and walnuts. Pour into the baking tin and cook for about 25 minutes until the top is cracking and the centre is just set. Leave to cool in the tin for about 20 minutes before cutting into squares. Serve warm or, if you can resist leaving them, cold. 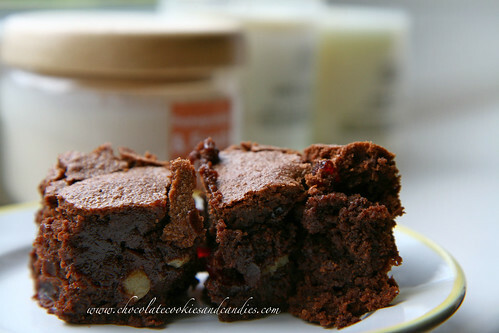 We backed (well, it was actually my hubby ^_*) brownies couple of days ago too, but without cranberries and walnuts. Would love to try your recipe next time, thanks for posting.